We can process your order securely right over the phone and get this wheel on the way to you! Just check out these discounts! You can e-mail us at sales@AmericanCeramics.com if you need any help with technical support, best wheels and/or specific shipping needs. Special Price - $725.00 pick up at our showroom! Add Worktable to this wheel - only $150.00! 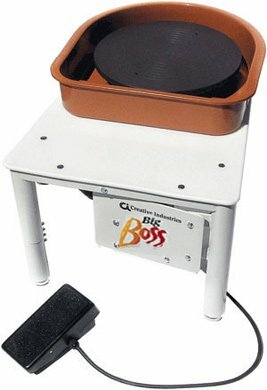 For potter’s with bigger needs the Big Boss has all the features of the Clay Boss and more. 1.0 horsepower - provides 150 pound centering capacity and maximum torque at lower speeds. Sophisticated load-sensing control high tech 110 or 220 Volts controler maintains wheelhead speed under changing loads. 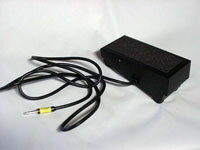 Variable Speed Footpedal - smooth electronic control ( 0-240 rpm). 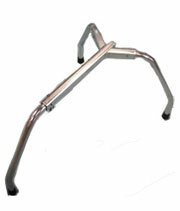 14” Wheelhead - sturdy steel structure (height 19.5") and long-life polypropolyne composite surface. Bat pins included. 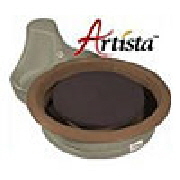 2-Part Removable Splash Pan included - for very easy cleanup and high volume liquid reservoir. Heavy-duty Steel Frame - with sturdy 26" x 21" table, protected by durable powdercoated finish. Custom Reverse Plug - standard, proprietary plug allows for quick change of wheelhead direction. Micro V belt drive - Provides quiet, dependable performance. Sturdy, high-impact plastic and steel frame construction 1/3 horsepower, industrial motor (large motor enclosure at back of wheel) 25-lb centering capacity 11" aluminum wheel head. Wheel head height is only 3 5/8" above tabletop. Stable on any flat surface. Convenient for stand up throwing or physically challenged access Easy to clean. Two-part splash pan included. Variable speed - hand control (0-220 RPM) Micro V belt for smooth and quiet power. 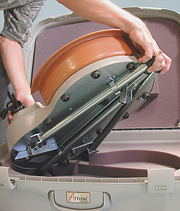 Convenient space for two 2.5 quart buckets, included (for tools and water) Totally portable, weighs 26 lbs. Makes a great trimming station. Ideal for schools with limited storage. Order left or right handed wheel head direction from factory. 2-year warranty.